The large gray house with the royal blue door sits on a one-acre level and secluded property in the South of the Y neighborhood. 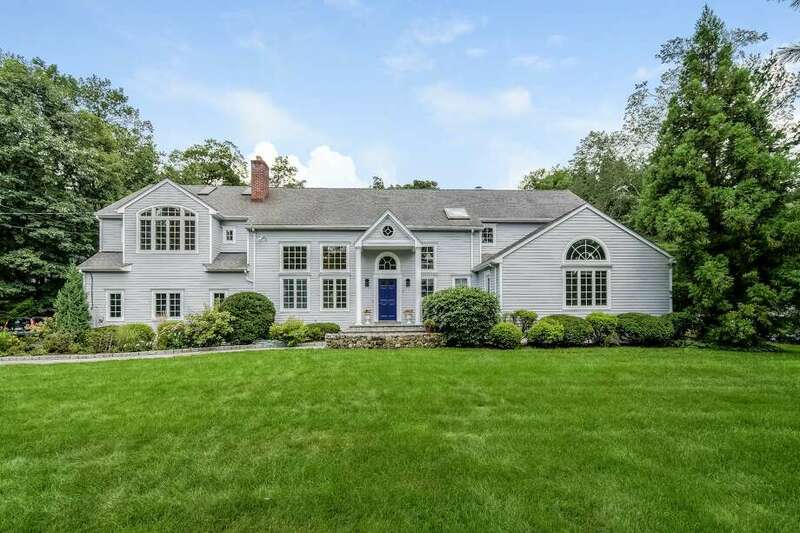 NEW CANAAN — The choice of where to purchase a home and set down roots is purely subjective. There are those people who prefer to be far from the madding crowd and there are others who prefer to be right in the thick of things. There are those who want to live in a classic colonial house and others who would rather inhabit the rooms of a contemporary house. At 25 Whiffle Tree Lane the property allows its occupants to feel like they are in a private setting while, in truth, they are only steps away from public schools, the New Canaan YMCA, and Waveny Park. Additionally, the house was built as a classic colonial in 1956 but in a subsequent upgrade it was given a clean “California cool” vibe; a classic New Canaan colonial with a bit of an edge, according to the co-listing agents. It serves as a bridge between the town’s traditional colonials and its contemporary masterpieces. The large gray house with the royal blue door sits on a one-acre level and secluded property in the ‘South of the Y’ neighborhood. Although the houses are close together in this neighborhood the sense of privacy is derived from the mature growth trees that border this property. In the backyard there is an in-ground swimming pool with a bluestone patio, and another larger wrap-around bluestone patio at the rear of the house that can be accessed from the kitchen. From the ample driveway there is a bluestone path, one side of it bordered by Belgium block, which leads to the covered two-story entrance marked by two tall columns. Inside, the house has 4,425 square feet of living space, 11 rooms, and five bedrooms. Sunlight floods the interior spaces helped by the tall ceilings in the foyer and formal living room, and skylights in some rooms. In the living room there is a milled beamed ceiling, marble fireplace, two stories of windows, a staircase with a decorative metal railing, and a wide entrance into the formal dining room. The dining room has chair railing above which there is attractive wallpaper on the upper walls. In the family room there is a fireplace with a decorative mantelpiece that features dentil molding, which is replicated in the crown molding of this room. The family room is open to the sizable breakfast room and gourmet kitchen, where there are numerous windows, skylights with automatic shades, and French doors to the patio. The kitchen features a large center island, granite counters, and stainless appliances including a Sub-Zero refrigerator. The adjacent office has a wall with three picture windows, allowing unobstructed views of the attractive backyard. This home has five bedrooms; three of them on the second floor and the spacious master suite on the first floor. The master has a cathedral ceiling with milled beams and an arched window above multi-paned casement windows. It also has a big walk-in closet, dressing area, and two additional closets. In the master bath there is a marble floor, double vanity with a marble countertop, shower, heated towel rack, and a claw-foot soaking tub. On the second floor one bedroom is en suite and has a walk-in closet, and the other two share a Jack-and-Jill-style bath. There is also a study and a wide loft landing area that could be a reading nook or homework station. In the finished basement there is a flexible-use bonus room, another family room with a door to the yard, and a full bath. For more information or to make an appointment to see the house contact April Kaynor and Kelly DeFrancesco of William Raveis Real Estate; Kaynor at 203-216-2194 or april.kaynor@raveis.com, or DeFrancesco at 203-667-4074 or kelly.defrancesco@raveis.com.